In Christ we live, we move, and have our beings. 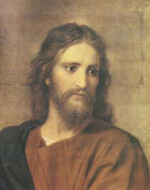 Please review our link on “Who is Jesus“. There you will find an in depth view of scripture that vindicates the truths regarding our Lord and savior Jesus Christ. 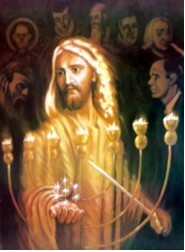 We also invite you to read Revelations chapters 1-3 to further understand the picture of Christ in the midst of the candlesticks. Truly our Lord Jesus is the same yesterday, today, and forever. Therefore we must seek for revelation as the church is built upon that foundation. It is only through revelation that we begin to understand the Word promised for our day. There was no one with Him when He trod the fierceness of the wrath of the fiery furnace. It was not another, but HIM Who hung upon the cross and gave His blood. He is the Author and Finisher of our faith. He is the Alpha and Omega of our salvation. We are espoused to Him and not another. We don’t belong to the church. We belong to Him. His Word is law. Creeds, dogmas, by-laws and constitutions have no effect on us. Yes, it is Jesus ALONE Who walks in the midst of the churches. It is God in her, willing and doing of His good pleasure. Never forget that. You have only one relationship to God and God has only one relationship to you–that is JESUS, and JESUS ALONE. …. Now I believe in good conduct. If you are saved you will do righteously. We have already gone over that. But let me tell you now, salvation is NOT Jesus PLUS. It is Jesus ALONE. SALVATION IS OF THE LORD. From start to finish it is all GOD. Let His life be in me. Let it be His blood that cleanses me. Let it be His Spirit that fills me. Let it be His Word in my heart and mouth. Let it be His stripes that heal me. Let it be Jesus, and Jesus Alone. Not by works of righteousness which I have done. No sir. Christ is my life. Amen. We bring all glory and honor to our Lord and Savior Jesus Christ, for He alone deserves the praise. When no one else could redeem us, the virgin birth produced the product. We are forever grateful for His love, for while we were yet sinners, He died for us, knowing that we would someday appreciate His ultimate sacrifice. Greater love hath no man than this, that a man lay down his life for his friends (John 15:13).